In fact here is his post in reply to mine and then we can go where ever we wish if the mystery of Phil makes you wonder. Of course, there have been some notable exceptions in the Left's coverage of Dallas -- Ramparts magazine in the 60s (as well as the more obscure but important Minority of One journal) and hey, Salon today (I take the blame for that). But by and large it has not been a pretty picture. Good Luck with your new Book "Brothers". I would like to let you know, if you haven't read it yet, that Phil Ochs met RFK on an Airliner and sang him his song about the Assassination of his brother and Robert cried. I remember Phil telling me about this but I can't remember if Phil told him that he was in Dealy Plaza as a "Security Observer". I kind of doubt if Phil told him because he was afraid of being killed about that fact but who knows because Bobby was probably scared like all of us.. I may be the only one Phil told about it because we shared secrets. I found Phil's photo from the Documentary on the History Channel and almost everyone I have sent it to thinks it is Phil or his double. Of course my Family and Phil's do not want to believe that Phil was there because since they were not aware of the secret stuff they do not want to get involved in the war over the conspiracy and like anyone do not have any control over where the truth may lead or how many other lies the government has in still secret files...or maybe truth is in those one million yet to be released documents. I believe we were both set up to be in Texas when JFK was shot but the fact that I lived to tell the tale makes me think that maybe there were some folks in the CIA or the Mob or whatever who also thought that the truth should come out some day. If anyone would like to see the photos and compare them with Photos of Phil and me singing at Ohio State two Years earlier, I well share them with the forum. It may be a good idea to start a seperate thread on your experiences surrounding the assassination. Althoug I'm 21 I'm a big fan of Phil Ochs The story about singing to Bobby is very interesting. Would you mind starting another thread and giving us a full round up of your knowledge in this area? http://www.petitiononline.com/mod_perl/signed.cgi?jfkgjury sign the petition for a JFK grand jury. "Justice Delayed means its never too late when it comes to the capital crime of the cover-up of the murder of the President of the USA. So, Let us begin serving Justice now! The Cover-up is the crime that keeps on taking." We Might as well start with the Photos of Phil that I burned off a CD of the History Channel "The Men who Killed Kennedy" .....and No folks, Phil did not shoot John or want anyone to because he just stares into the movie lens like a deer in the headlights. So in the cause of justice, I need help in how to post those photos..... In the meantime if any of you souls are brave enough to face the truth that has been hidden, I will email the goodies to you pronto....just send me your request to jimglover@verizon.net and if there is any problem with the Mob controlled intertainment industry, just tell them I said it is fair use in the interest of Justice. I've been a fan of Phil Ochs for a long time. I had no idea he was interested in the JFK assassination, despite the nature of his music, which was pretty much strictly social commentary. Was he a real critic of the Warren Report? 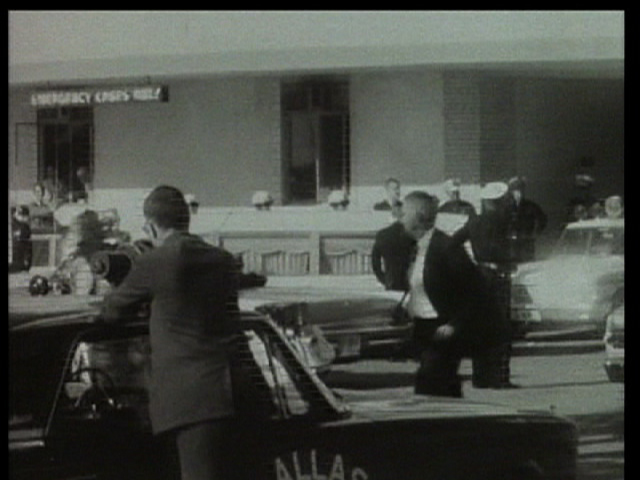 Also, please enlighten us on the pictures in Dealey Plaza that may be of Phil. Why do you suppose he would have been there? Did you ever ask him about it? If so, what did he say? Anyhow, interesting stuff. Please continue to share. 'a security observer' for who or what?! Phil Ochs as a singer song-writer is first class. Bobby may have been 'scared', but not like the 'rest of us' he knew much more about the powers behind the actions and its anticedents and consequences than we did/do - and was killed to prevent him acting upon that information I believe, no matter what one things he was thinking or planning or knew. Thanks Peter...Phil was great and I got him into folk music....I taught him guitar and he wanted to learn to sing with a vibrato...nice sometimes. Phil used to say to me "Jim, I will never lie to you but there are some things i cannot tell you". When we were roommates at Steeb Hall, Ohio State, he let me know he was in contact with a surveillance operation on students and even told me during one off our heated discussions about communism..."Good or Evil?" Phil told me I was "Fair Game". It was a military culture because ROTC was mandatory and Phil was a sergeant in the Air force and I was private Army cadet.... He liked to pull rank on me and I RESENTED IT...BUT WE HAD A BALL ANYWAY. Being a "Security Observer" was a new one for me too when Phil first told me where he was some months after our Texas journeys...but i had just told Phil where I was in Texas when JFK was Shot so when Phil said "Security Observer" I thought that could be the job description that i took on as well...we can get into that later or i will digress too much from your question. It was many months before Dallas that Phil came to Jean's place on Thompson Street in the village where I was living in sin....and while Jean was out, Phil gave me some secret info. There was a plot to kill Kennedy and do I know anything about it. He said he was working for some domestic national Security program kinda like the CIA but these are the Good Guys in the war between the bad guy Hoover's FBI and JFK and the Good Guys. Phil never told me who or gave me any names of who was his boss at that time but that would have been foolish if he did and probably dangerous for us both because I had a big mouth...and you know there wasn't much crime in our neighborhood. Phil said he was working for the Fair Play for Cuba Committee in order to find out more about the plot and i said I would let him know if i heard anything....I kinda remember we were supposed to meet somebody in the subway station but they never showed so I never met the Fair Play for Cuba guys but many years ago I called VJ Lee of the Veterans for Peace and he told me "Oh yes Phil was working with us". So all I remember about his Dallas trip was what he told me only once and that was that he he was standing on the street by the scene...not sure but I have in my mind that maybe by the building he was filmed at cause around 1993 I saw a film of what looked like the folks on Houston Street and I saw a man who looked like phil duck.... and after JFK was shot he went towards the scene and saw the commotion... a woman crying.... and I think he may have mentioned that he had gone with someone in NY that he knew...maybe in the Gambino family not sure .... they were probably being set up too come to think of it. Phil did say he thought it was a Para-Military operation. I asked Phil if he could prove that he was there and he said "Well I was being filmed by some cameraman while I was standing in the big garage Doorway just across the street from the Book Depository". He got a flight out of town and was afraid he wouldn't and he met the cameraman who was on his way back to England. Gee after what RFK knew, he must have been more scared then Phil and Me. Not nice memories ...but it is history. So the lesson I learned from Phil is that you can't know everything about it but if you don't give up, You may learn enough to overcome it. I asked Phil of he can prove that he was there and he said "Well I was being filmed by some cameraman while I was standing in the big garage Doorway just across the street from the Book Depository". When you go to make a post, look down at the bottom of your screen. The photo has ben reduced, so you will need to click on my picture above to enlarge it a little. On the right hand side, click on the button that says, "Browse." Once you have selected the source of your photo (Drive D or C or whatever) and selected the photo you want to upload, then click the "Upload" button. This will transfer your photo from your computer to the Education Forum's computer. It will tell you if the upload has been successful. Just above those two buttons is one that says, "Manage Current Attachments." If you click on that, there is a small button that says, "Insert attachment into text editor." Plant your cursor anywhere in the body of your message, click on the "Manage Current Attachments" and then click on "Insert attachment into text editor. If you scroll down a little farther, you can preview your post before you actually send it to see if it looks the way you want to. Thanks Don I think I covered some of your questions in the reply I just gave Peter...sorry I hit the reply twice. Well yes, Phil was very interested in the case...he was a witness. But he did not know who did it for sure so he did not put himself on the firing line. I knew Phil very well and he would be happy that he was able to give us some clues to the truth and I am happy to pass them on. But it was dangerous back then even in 76 when Phil Hung himself...of course I can't say for sure that he hung himself. Actually Phil showed me his photos of JFK autopsy at his place in LA while we were getting ready for the Midnight Special show around 74. He had a photo of General Walker's House with a sign on the front lawn about "Free Cuba" or something like that and we smoked a couple of his real Cuban cigars. The film clip of Phil in Dealy was not available until 1988...twelve years after he died. I believe if the media had not waited 24 years to release that footage, Phil would have come out of the closet like I was asking him too. Since he is in the background of the footage probably only Phil or I would have been able to identify him because it goes by in a few seconds. But our lives would have still been in danger because the cover-up of "nobody knowing anything but Oswald" and it would have blown the case wide open and here we are...lucky to be alive. I guess i am lucky because I know more about the case now after all our study and new evidence popping up. If you are interested , get the books out on Phil Ochs and goggle him. there is a lot out there but not much on the secret stuff. I guess that is my job. Thanks Thomas...I well give it a shot. I am the tall Banjo player and Phil is wearing his favorite sport coat...He never took it off. "Sorry, an error occurred. If you are unsure on how to use a feature, or don't know why you got this error message, try looking through the help files for more information." Well I'll be... they do work and I got more of um too. Phil wore the same jacket at newport 64. We all know Harvey Oswald was working for the FPFC Committee. I wonder if Harvey knew about the coming assassination. Judyth, for what it's worth, said LHO knew Kennedy was going to be killed and was working to stop it. Curiously, Harvey and Phil Ochs were both told to be in that vicinity. Supposedly they knew of a plot to kill Kennedy. Yet neither did anything to stop it. And one became the patsy. Ochs said he was there as a "security observer." Is it too far-fetched to think Ochs could have been set up as a patsy if something went wrong with Oswald? The 2 being on the FPFC committee and in Dealey Plaza when Kennedy was shot. We know so much went into setting up Harvey. According to Harvey and Lee by John Armstrong, lookalike Lee Oswald was shooting from the 6th floor window at Kennedy's limo on Elm. 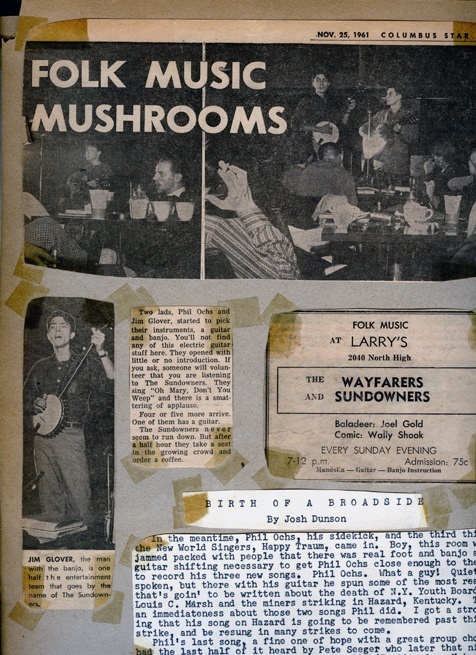 Could there be something going on we don't know about -- a setting up of Phil Ochs? A "double?" I wonder if he was murdered. I Don't know if Phil was murdered...He would tell me that he would talk about Dealy someday but that never happened and in 1976, it was scary time to talk and many people who knew too much were still getting killed. When I was singing and talking about it in Chicago, The Mob boss was murdered and a man came up to me at the Quiet Knight and handed me his card with a black hand emblem on it and said "Let me know if you need any help". Phil Told me once that he was warned (he did not tell me who) that if he talked they would say that He was crazy and that Phil was working for them. I don't think that he was too worried about being accused of having mental problems since he was supposed to be taking medication like Lithium for his Manic Depression, but I think his biggest fear was that he wanted to have his legacy intact as Folk Singer without any involvement or knowledge in the mystery which was much more unsolvable back then then it is now. Anyone with knowledge would get blamed because the cover-up was ordered by Johnson and even that was covered-up. When Phil was in his more military Gung Ho modes even back at Ohio State I used to defend Gary Powers who was shot down in his U2 over Russia and Phil said "he should have taken his suicide pill as he was supposed to". He loved being the devils advocate sometimes. Phil did talk of suicide to me maybe once or twice. He may not have known who were really behind the people who threatened him to shut up about it. If we are getting closer to them now...How could we expect him to figure it out back then. Now here is what I know about the double Oswald. The WC dismissed all evidence, including FBI because they thought there was only one Oswald. Allen Dulles was in charge of what secret files could be seen. I myself saw a taller looking Oswald in the custody of two Dallas Cops get on a shadow or 2nd Hollywood Hootenanny Tour bus shortly after the assassination, as I have told the FBI and Justice Dept. I talked to Butch Burrows who was the usher at the Texas Theater where Oswald was arrested and Butch told me and Later our concert at the Theater in 93 that the police were taking a taller looking Oswald out of the side door at the same time that Oswald was being taken out the front door and Butch showed me the side door. The research community has never gone into this even though I invited them all to the concert for JFK truth that night. Phil could have talked but how would he know that his family would not be hurt or if what he knew could be proved...remember the photos of Phil were not released until 12 years after he was gone...and like the Zapruder film was not released for about 12 years too. I also saw George Bush on that same Bus and the man who pointed him out to me was David Ferrie who was on to me in Cleveland because I went back to my Old neighborhood in Willowick Ohio to try to find out the name of the man who wanted me to spy on my Folks around 52. I was in High School at the time, late 50's, I was threatened by a friend who knew Bush and got threatening calls from a guy who acted like a gangster at that time also.... All this because I was looking for Bush because a friend would not believe that I was asked by Bush to spy on my folks. I always was bad at remembering names off hand and I don't think Bush even ever told me his name...Why would he? The Photo of Bush in front of the Book Depository sure looks just like him and I found some from the Parkland Hospital that look just like him also but it is mostly from the back and just a little to the side. Bush was sitting next to Hoover on the bus and we know that Bush called the FBI about a student at Houston University who supposedly made threats to JFK.....I believe that was a ruse so that he could have a talk with Hoover later that day when I saw them together on the same Bus with many other strange men and we were ordered to close all the window shades of the bus so that we could not see the airplane they flew in on but somebody said "we are at an airport and after most had gotten on after loading lots of heavy luggage into the Compartments below, I heard someone say "the Corsican Brothers are Here". I did not here any cheering about that. That night was a scary one at the Pines Motel, in the Sam Houston National forest near Point Blank Texas and believe it or not it was next door to a Texas National Guard armory which could have been convenient for getting arms for Para military operations. That night men were celebrating long into the night and a man came into my little room and said "Don't go out side tonight because there is a man with a shotgun looking for Kennedy's killer.....I heard shots that night and I figured they shot the guy the cops had in there custody even before I saw the resemblance to Oswald because they both reminded me of Mark Tepping who I was supposed to room with at Ohio state...but Phil became my roommate instead. Jim, if you are able to, could you post the photos of Bush at Parkland? Notice the bulge above his left shoulder....It seems the cordinators had there own frequency. When I first sent them to Gary at the 6th floor museam, he said the man was too short to be Bush. A friend of mine in Detroit calculated the height of the Police car and the curb he propbaly would be standing on and said the man was 6 feet 2" ...a match there. Then he said it was a another guy he knew but never came up with the name. He said he would ask George Bush for the museam What he was doin in Dallas when he told the FBI about the possible student threat to Kennedy when Bush says Please keep this confidential and I am on my way to Dallas". I can't recall would be typical. Thanks for posting these pictures, Jim. At this time, I'm not convinced that it's George Bush Sr. I'd like others' opinions -- the photo experts. I would love any expert opinion or anyone who has seen TV images of Bush taken from behind. Sinse I saw him that day along with two Dallas Police with the taller Oswald look a like, I was searching for him in the photos. If I am wrong, that is fine because the truth is what I am after. It has been a while but have you found out who the two look-a-likes for George Bush are Yet? The name of the one standing with his hands in pockets in front of the TBSDB and the one I picked out at Parkland leaning on the police car? And has anyone asked Bush about his call to the FBI and why he said "I am on my way to Dallas"? I made a mistake in a previous post when I wrote "a man gave me his card that had the Black Hand on it" was at the Quiet Knight in Chicago....It was the Earl Of Old Town in Chicago instead....both great Clubs. Glad you started a new thread on this. I didn't know Phil Ochs, but I think we were busted together in Chicago in '68 at the Democratic National Convention. It was the last night of a week of demonstrations and riots, and those of us who were on McCarthy's national staff were sitting around the McCarthy rooms of the Conrad Hilton Hotel. Someone handed me a drink of whiskey and water and mentioned to me that it was Phil Ochs who was playing guitar and singing in the hall nearby. About an hour later I laid down to sleep only to be awakened by a rush of Chicago police breaking heads with billy clubs in a celebrated raid that ended with a bunch of us under arrest. I was only 17 years old, a high school junior who later went to the University of Dayton, Ohio, where there was manditory ROTC for freshmen until discontinued the year I arrived. The campus ROTC were notorious for being informants against radical agitators protesting the Vietnam war. While I never crossed paths with Phil Ochs again, I believe it was him in Chicago, and was saddened when I learned he had died. 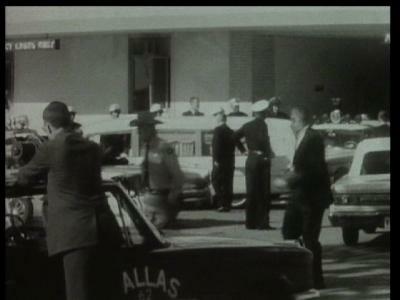 I am quite surprised that he was at Dealey Plaza too. You say that he returned on a flight from Dallas with a cameramen who was returning to England? Do you know the name of the cameramen and what became of his film? Also, did you ever go to Newport?